Designed and develop e-learning for federal client's training academy. Facilitated training development by coordinating activities and information gathering with Subject Matter Experts (SMEs), graphic artists, flash developers, and video/multimedia specialists. Provide instructional design consultant services for organizations such as Air Force Medical Services and Department of Veteran Affairs. Full instructor led training courseware development including training materials, manuals, quick reference guides, etc. Full e-learning courseware development Created Design Documentation to include: developing a learning management system (LMS), storyboarding and scripting courses, developing courses using Adobe Captivate, and publishing final courses to server. Tracking and reporting completion rates and Kirkpatrick Level 1 results. Conduct Kirkpatrick Level 3 evaluation for the Veteran Affairs Learning University. Develop learner and supervisor surveys. Evaluate results from participants determining level of change due to training and factors that enabled or hindered change. As a member the SBInet training team developed and delivered training for Boeing and Department of Homeland Security (DHS). 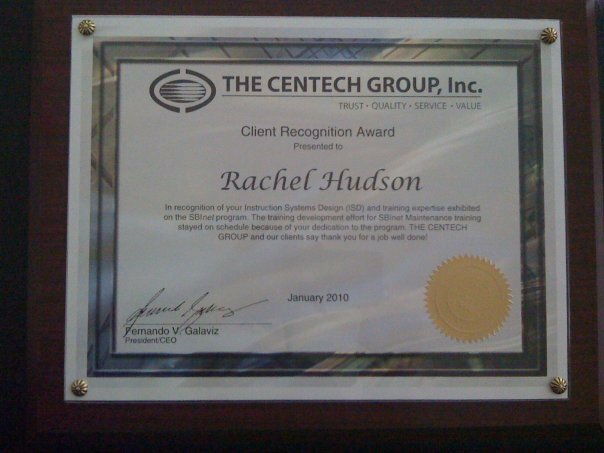 ·Received a Client Recognition Award in January 2010 for dedication to the training program and ensuring the training stayed on schedule. Provide customer support for web-based products on multiple networks. Select items to be transferred from one security or network domain to another security or network domain in accordance with policy. Transfer selected items and load to the correct location on the server, ensuring indexes, metadata and other supporting information is updated as needed. Perform quality assurance of all items transferred and loaded including text, images, hyperlinks, metadata, and HTML metatags and ensure that all items are properly presented by the web browser. Serve as the final human reviewer of items to be released to the target security/network domain. Ensure appropriate records of data and information transferred are created and maintained. Capture, maintain and accumulate statistics that show quantities and timelines for products and data transferred from one domain to another domain. As a member of the Immersion Team collaborated on an instructional design project for T/TAC Online, an organization that falls under the umbrella of Virginia Department of Education (VDOE). Recommended that T/TAC update the staff login and view of T/TAC Online. The proposed new design would streamline the development of online training while staying consistent with Section 508 Compliance. Served as a team leader for the customer call center and developed on-the-job training guides. Assist in the compilation of student assessments/evaluations. Prepare statistical data as needed. Collaborated with Facilitators on the module “Problem Solving”, adding validity, i.e. real life scenarios that focuses on why the module is important to the student. Ms. Hudson was a full-time, Immersion student and served as a member of eight students working on an instructional design project for T/TAC Online, an organization that falls under the umbrella of Virginia Department of Education (VDOE). Different from a traditional three-credit course model, the Immersion Program allows students learn to manage and solve complex instructional issues related to effective instructional design much as they would in the real world. Professors, instructors, and representatives from the sponsoring organization support students through the project experience. The Immersion Program is designed to allow students to participate in at least two separate project practicums, which allow for the opportunity for involvement in multiple roles and the refinement of the design processes crucial to this field of study. The outcome of the full-time experience is to analyze, design, develop and evaluate a project prototype based on current theory and practice and presented to the client-sponsor organization. To accomplish this, students are assigned specific roles in project teams of approximately 8-10 student members as part of their project development practicum. The design teams focus on the assigned project to propose and develop solutions for that particular design situation. Students are required to work together in this intensive team-based experience to apply and refine a myriad of instructional design and development skills as well implement a high level of communication and problem solving skills that provides significant grounding for the real world practice of instructional design. 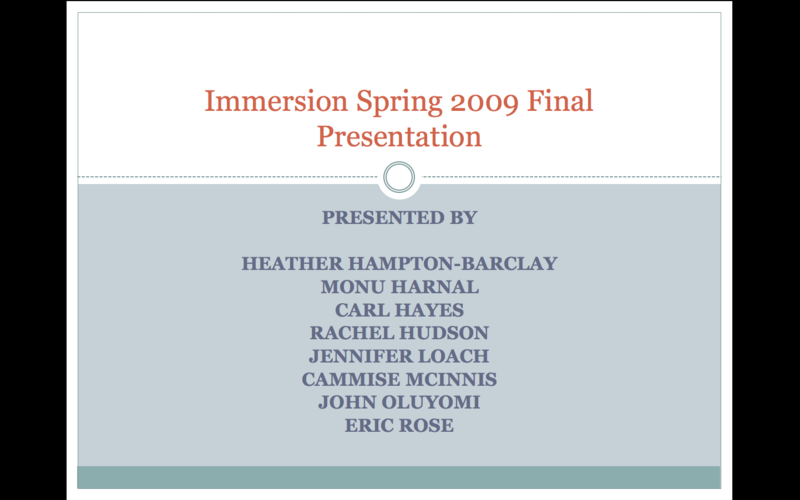 The Immersion Team presented their findings & recommendations to T/TAC staff on December 8, 2008.